Like many others, do you also believe that the popular system-cleaning tool CCleaner was performing well before Avast acquired the software from Piriform last year? If yes, then pop-up advertisements in the previous CCleaner software version was not the last thing you have to deal with. Avast has released a new version of CCleaner 5.45 that not only always runs in the background, but also collects information about your system without giving you a way to turn the feature off. CCleaner is a popular application, available in both free and premium versions, with over 2 billion downloads that allow users to clean up their Windows, Mac, and mobile devices to optimize and enhance performance. Last year, CCleaner made headlines when it suffered a massive supply-chain malware attack of all times, wherein hackers compromised its servers for over a month and replaced the original version of the software with the malicious one, infecting over 2.3 million users worldwide. This time the system cleaning software is in headlines due to "monitoring and data collection" features Avast added in past few months to your favorite system optimizer application. CCleaner 5.43 released in May—removes the option to opt out of data-sharing feature for users of the free software version. CCleaner 5.44 released in June—adds pop-up advertisements. 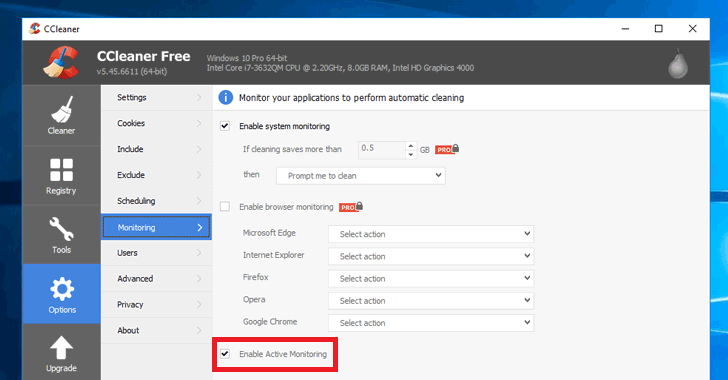 CCleaner 5.45 released in July—forces Active Monitoring and heartbeat features. These monitoring elements of CCleaner send user data such as anonymous system usage data back to the company's servers, as well as continuously scan systems to inform users when it comes across any junk or browser file, as first reported by Techdows. What's concerning is that even after turning off the Active Monitoring feature from CCleaner's menus, it turns back ON automatically whenever users reboot their computer or close the software. In its changelog for CCleaner 5.45, Avast notes it "added more detailed reporting for bug fixes and product improvements." Besides this, CCleaner now also sends a heartbeat every 12 hours which reports up-to-date usage statistics to Avast, allowing the company to faster deliver bug fixes and product improvements. When asked about it on its forum, CCleaner said heartbeat sends only "non-personal, absolutely non-identifiable usage information to improve CCleaner." Though the information CCleaner gathers is entirely anonymous, users on various internet forums expressed their concerns about Avast data sharing practice, saying that the company ruined their favorite tool after acquiring it. "We reserve the right to store and use the information collected by our software and to share such information among the Avast Group to improve our current and future products and services, to help us develop new products and services, and to better understand the behavior of our users." In response to the users' complaints about Active Monitoring, Avast said on its forum that the company will offer separate menu items for turning off Active Monitoring and sending anonymous usage data (heartbeat). "We will separate out Active Monitoring (junk cleaning alerts and browser cleaning alerts), and heartbeat (anonymous usage analytics) features in the UI, and we will give you the ability to control these individually," the company said. "We will take this opportunity to rename the Advanced Monitoring features in CCleaner to make their functions clearer." Avast said the company will roll out these changes in the coming weeks. So, users are recommended to hold off on upgrading their software to version 5.45 until the new update is available to download. For those who have already upgraded their software to version 5.45 can disable Active Monitoring by forcefully terminating CCleaner using the Task Manager or third-party process management software for a while until the next version arrives. "As part of our ongoing mission to improve CCleaner and deliver a better customer experience, we introduced some features in Version 5.45 aimed at providing us with more accurate data that would help us to detect bugs more quickly and let us know which CCleaner features are being used and which aren't. The information which is collected through these new features is aggregated, anonymous data and only allows us to spot trends. This is very helpful to us for the purposes of improving our software and our customers’ experience. No personally identifiable information is collected. We value the feedback from our users and are currently working on our next version of CCleaner which will separate out cleaning functionality from analytics reporting, and offer more user control options which will be remembered when CCleaner is closed. In the interests of transparency, we’ll also share a fact sheet outlining what data we collect, its purpose and how it is processed. We’re also taking the opportunity to redesign the data settings within CCleaner so they are communicated in a clear and easy to understand way. Building and testing software sometimes takes a little time to get right, but we are working hard to release our next version as soon as possible."